What about sudden cardiac arrest in the young? What is the prognosis for sudden cardiac arrest? A natural disaster hits, the power goes off and the lights go out. It's a common scene that plays out during hurricane and tornado seasons, and it's very similar in trying to explain sudden cardiac arrest. The heart sustains an insult, the electricity is short circuited, the heart can't pump, and the body dies. The heart is an electrical pump, where the electricity is generated in special pacemaker cells in the upper chamber, or atrium, of the heart. This electrical spark is carried through pathways in the heart so that all the muscle cells contract at once and produce a heart beat. This pumps blood through the heart valves and into all the organs of the body so that they can do their work. This mechanism can break down in a variety of ways, but the final pathway in sudden death is the same: the electrical system is irritated and fails to produce electrical activity that causes the heart to beat. The heart muscle can't supply blood to the body, particularly the brain, and the body dies. Ventricular fibrillation (V Fib) is the most common reason for sudden death in patients. Without a coordinated electrical signal, the bottom chambers of the heart (ventricles) stop beating and instead, jiggle like Jello. Ventricular Fibrillation is treated with electrical shock, but for it to be effective, the shock usually needs to happen within less than four to six minutes, not only for it to be effective, but also to minimize brain damage from lack of blood and oxygen supply. Automatic external defibrillators (AEDs) are commonly available in public places to allow almost anybody to treat sudden death. Less commonly, the heart can just stop beating. The absence of a heart beat is known as asystole (asystole: a=no + systole=beat). Sudden death is most often caused by heart disease. 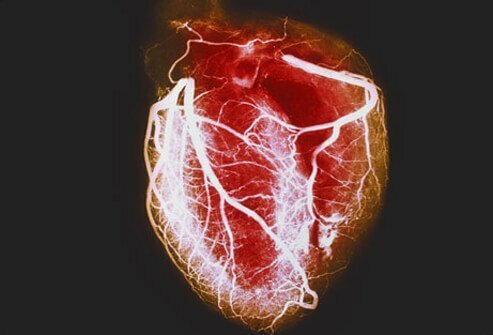 When blood vessels narrow, the heart muscle can become irritated because of lack of blood supply. In heart attack (acute myocardial infarction), a blood vessel becomes completely blocked by a blood clot, and there is enough irritability of the muscle to cause ventricular fibrillation. In fact, the reason many people with chest pain are admitted to the hospital is to monitor their heart rate and rhythm for signs that might lead to ventricular fibrillation. Sudden death may also be the first sign or symptom of heart disease. Congestive heart failure and heart valve problems, like aortic stenosis (narrowing of the aortic valve) also increase the risk of sudden cardiac arrest. Cardiomyopathy is a broad category of heart disease where the heart muscle does not contract properly for whatever reason. Often it is ischemic, where part of the heart muscle doesn't get an adequate blood supply for a prolonged period of time and no longer can efficiently pump blood. People whose ejection fractions (the amount of blood pumped out of the heart with each heart beat) is less than 30% are at greater risk for sudden death (a normal ejection fraction is above 50%). In some people, cardiomyopathy may develop in the absence of ischemic heart disease. Inflammation of the heart muscle, known as myocarditis (myo=muscle + card=heart + itis= inflammation), can also cause rhythm disturbances. Diseases like sarcoidosis, amyloidosis, and infections can cause inflammation of the heart muscle. Some people are born with electrical conducting systems that are faulty, which place them at higher risk for rhythm disturbances. 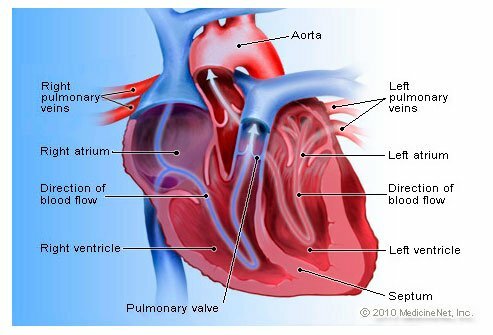 Some are due to the wiring, or electrical conduction system, like Wolff-Parkinson-White syndrome, while others are due to the structural basic structural problems within the heart, like Marfan syndrome. Pulmonary embolus or a blood clot to the lung, can also cause sudden death. Clots form in the leg or arm and may break off and flow to the lung where they decrease the lung's ability to get oxygen from the air to the body. Risk factors for blood clots include surgery, prolonged immobilization (for example, hospitalization, long car rides or plane trips), trauma, or certain diseases like cancer. Cardiac arrest is the sudden loss of cardiac function, when the heart abruptly stops beating. Unless resuscitative efforts are begun immediately, cardiac arrest leads to death within a few minutes. This is often referred to by doctors as "sudden death" or "sudden cardiac death (SCD)." In younger people, sudden death is a rare event, but since it often involves people involved in athletics, cases are often reported in the press. The most common cause is hypertrophic cardiomyopathy (hypertrophy=to grow abnormally large + cardio=heart + myopathy = diseased muscle). This disease is often hereditary, and the walls of the ventricle are larger than they should be. This makes the pumping chamber of the heart smaller, and the heart has to work harder to pump blood out of the heart. As well, the thickened muscle narrows the space for the blood to flow through the aortic valve and to the rest of the body. During exercise, this decreased blood flow can irritate the heart muscle itself and cause ventricular fibrillation, collapse, and sudden death. Anomalous coronary arteries can also cause sudden death in the young. The heart is a muscle itself, and like any muscle, it needs blood supply to provide oxygen for it to work. Normally, the coronary arteries lie on the surface of the heart. Anomalous arteries dive into the heart muscle itself and may be occluded when the heart muscle that surrounds the abnormally placed artery squeezes aggressively, as with exercise, shutting off blood supply to part of the heart. This irritates the electrical system and can cause ventricular fibrillation and sudden death. The pre-participation athletic physical examination is a useful tool to screen children andadolescents for their risk of sudden cardiac arrest. Commotio cordis is a situation in which the heart stops when the chest is hit by an object. News stories occasionally report of baseball players who are hit in the chest by a ball and collapse because their heart stops beating. The heart sits behind the breastbone, and the electrical system can be short circuited when a direct blow is sustained. Almost immediate loss of consciousness occurs, and the affected person will not be able to be aroused. No pulse will is felt (palpable). There will be no signs of breathing. Sudden cardiac arrest is an unexpected death in a person who had no known previous diagnosis of a fatal disease or condition. The person may or may not have heart disease. The vast majority of people whose heart stops beating unexpectedly have ventricular fibrillation. The definitive treatment for this is defibrillation using electricity to shock the heart back into a regular rhythm. With technological advances, AEDs are now a routine sight wherever people congregate. Communities which institute public CPR education, use of AEDs, and rapid activation of 911 emergency medical services have dramatically increased survival rates from sudden cardiac arrest. Unfortunately, because the brain is so sensitive to the lack of oxygen and blood flow, unless treatment occurs within four to six minutes, there is a high risk of some permanent brain damage. Should the patient survive to be transported to the hospital, the reason for collapse and sudden death will need to be diagnosed. Regardless, the ABCs of resuscitation will be re-evaluated. Airway, Breathing, and Circulation (heart beat and blood pressure) will be supported, and admission to an intensive care unit is most likely. Diagnostic tests may include repeated electrocardiograms (EKGs), echocardiogram (ultrasounds of the heart), and cardiac catheterization and electrophysiologic studies, in which the electrical pathways of the heart are mapped. Recent research involving the treatment of survivors of cardiac arrest suggests that prompt institution of hypothermia (cooling of the body) may prevent or lessen the degree of brain injury. Survivors of sudden cardiac arrest are often candidates for implantable cardiac defibrillators. Death is best treated by prevention. Most sudden death is associated with heart disease, so the at-risk population remains males older than 40 years of age who smoke, have high blood pressure, and diabetes (the risk factors for heart attack). Other risks include syncope (fainting or loss of consciousness) and known heart disease. Syncope, or loss of consciousness, is a significant risk factor for sudden death. While some reasons for passing out are benign, there is always a concern that the reason was an abnormal heart rhythm that subsequently spontaneously corrected. The fear is that the next episode will be a sudden cardiac arrest. Depending on the healthcare provider's suspicion based on the patient's history, physical examination, laboratory tests, and EKG, the healthcare practitioner may recommend inpatient or outpatient heart monitoring to try to find a clue as to whether the passing out was due to a deadly heart rhythm. Unfortunately, the potentially suspect rhythm may not recur and depending on the situation, prolonged outpatient monitoring lasting weeks and months may be necessary. Use of electrophysiologic testing may help identify high risk patients (the electrical pathways are mapped using techniques similar to heart catheterization). Using implantable defibrillators in high risk patients, especially those with markedly decreased ejection fractions can reduce the incidence of sudden cardiac arrest. These devices are placed under the skin in the chest wall and have wires that are attached to the heart itself. When they detect ventricular fibrillation, a shock is automatically delivered to the heart, restoring a heart beat and averting sudden death. The frequency of sudden cardiac arrest is related to the frequency of coronary artery disease. If public health initiatives work to decrease risk the factors for heart disease, the risk for sudden death should decrease as well. In the adolescent population, increased awareness of hypertrophic cardiomyopathy and appropriate screening may decrease the frequency of sudden death. Public education and widespread availability of AEDs will increase survival. "Overview of sudden cardiac arrest and sudden cardiac death"
Heart transplant consists of three operations: 1) harvesting the heart from the donor, 2) removing the recipient's damaged heart, and 3) the implantation of the donor heart. The selection and distribution of donor hearts is a careful process so that the hearts are distributed fairly. For the patient requiring a heart transplant, all other important organs in the body must be in good shape. The most common complication of heart transplant is organ rejection.